Instacasino launched in 2015 and brought with it a sleek and eye catching theme, so of course we at Mobile Bingo Bonuses were eager to tell you about them. Designed by a group of passionate casino experts, this amazing site is the perfect combination of high quality games and generous bonuses. Let’s start with the games, because it’s pretty much the reason we’re here. On Instacasino you can access an incredible variety including table games, jackpot games, video poker, live casino and video slots such as Koi Princess and James Dean. Over 40 of these games are available on mobile and tablet devices such as Android, iOS and Windows; simply download the app and away you go. To contact a representative for support, you can either live chat, email or telephone and they aim to respond within a reasonable timescale. 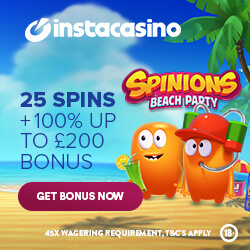 So if you’re ready to make your way through these incredible welcome bonuses, then simply head over to Instacasino and enjoy! For new account holders looking to take advantage of the welcome bonus, it’s worth noting that certain conditions apply. So it may be worth reading the welcome bonus T&C’s or Instacasino’s full T&C’s.